Mark Rutte (born February 14, 1967) is a Dutch politician and leader of the liberal party VVD since 2006. Serving as Prime Minister of the Netherlands since October 14, 2010, he led three cabinets. Rutte was born in on February 14, 1967 in The Hague. He is a member of the Dutch Reformed Church. 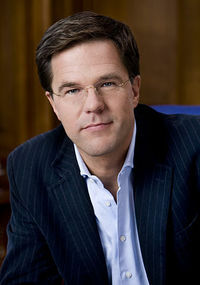 Mark Rutte studied at the Leiden University where he achieved one Master of Art in 1992. Rutte worked as business manager for the Dutch company Unilever and become later a Human resourcer for that company. Mark Rutte is generally described as an conservative liberal poltician, but his policies towards multiple issues were more on the progressive side, such as European integration. Rutte attended the Dutch poltics in 1988 where he was the leader of the Youth Organisation Freedom and Democracy (the Youth organisation of the VVD) until 1991. In 2002 Rutte was appointed as Undersecretary for Social Affairs and Employment in the second Balkenende cabinet, which existed until June 17, 2004, In the successive government he was Undersecretary for Education, Culture and Science until June 27, 2006. In preparation for the Dutch general election in November 2006, the VVD held an election for their new party-leader which was elected by the party members, Rutte opposed it to the at that moment favourite Rita Verdonk (which leaved the party in 2007), Rutte has won this election. After the Dutch general election in June 2010, the VVD wins 31 seats, and Rutte becomes Prime Minister of the Netherlands on October 14, 2010, the formed government existed of his party , the CDA a Christian democratic party and tolerated by the Party for Freedom of Geert Wilders. The policies were strong on immigration, tackling the rising unemployment, and had a roughly opposition from the Mainstream media and leftist parties, because of the participation of Party for Freedom, which is also blamed for the failing negotiation between the coalition partners for the budget of the next year. After the collapse of this government on April 23, 2012 in due to the failed negotiations about the reforms and budget for 2013, elections were held again in September 2012, where Rutte's party wins again followed by the socialist Labor Party, they have formed a cabinet for four years and can be known as an government with dramatically policies towards open borders, more support for the socialist European Union, more corruption within both parties and ongoing immigration, like other nations in Western Europe. This page was last modified on 20 October 2018, at 09:17.